An early-season snow storm struck parts of the East Coast last weekend and I was determined to capitalize on the phenomenon. Since the snow wasn’t projected to come anywhere near the Richmond, VA area, a friend and I started out at 3:30 in the morning to drive 4 hours in order to be where the snow was supposed to fall by sunrise. The image below is the result. My friend suggested a park on the New River that he had some experience with and when we arrived, the snow was starting to coat the trees on the tops of the hills and ridges in the area. The trees below a certain altitude, however, were untouched. This made for an interesting composition when paired with the mist rising from the river. Hope you enjoy. 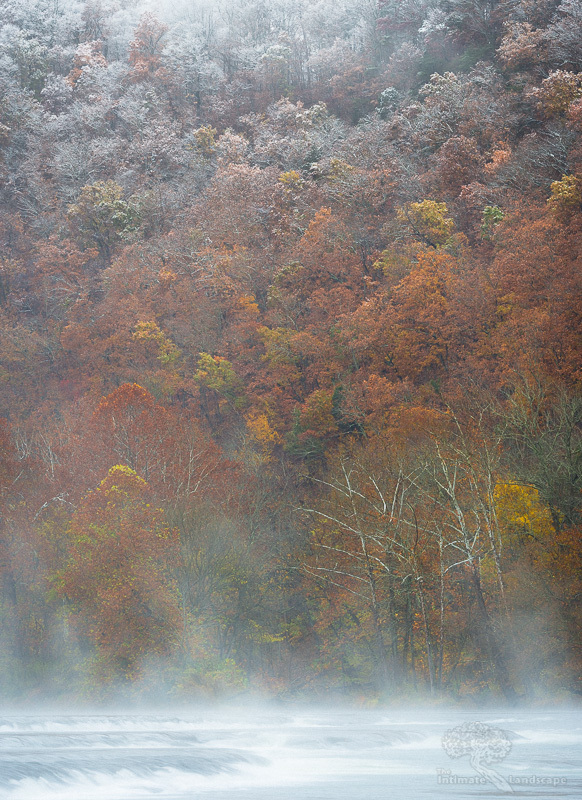 An early-season snow whitens the trees above while mist rises from the New River below. This entry was posted in Landscape Photography, Winter and tagged autumn, Fall, Fall Colors, mist, New River, river, snow, winter.